I touched on mixed messages in my last post, which discussed the Feared Leader. When people receive mixed messages they are emotionally confused and conflicted. Conflict happens when we think a message is going one way – good – but turns out to be going another way – bad. Employees will doubt the leader’s intention. Leaders often exacerbate the situation by pretending that the messages are consistent and do not permit any discussion about it to take place. The doubted leader will drive their employees mad by saying ‘self-manage, be innovative and take risks’ whilst also saying ‘plan and only deliver on the tasks I give you’. The doubted leader needs to acknowledgethat this conflict exists. Chris Argyris, in HBR, describes what happens when the conflict is ignored. 4. They top it off by making this undiscussabilityundiscussable too! He highlights the fact that the issue is not that people cannot deal with mixed messages. We do it all the time! Just like, Mum said one thing whilst Dad said another scenario. But it becomes a massive problem when the perceived ‘powers-that-be’ act as if their messages are not in conflict and prevents any discussion of the matter. The doubted leader needs to acknowledge that when employees appear frustrated, angry or confused, it could be that they are receiving mixed messages. What the doubted leader needs to do is discussit. This doesn’t mean that the mixed message will change because it most likely won’t, at least in the short-term. The message doesn’t have to change immediately. If employees and their leaders can talk about it, and joke about it, it creates what Argyris calls a ‘psychological freedom’. Raising the awareness and acknowledging the issue removes the frustration. The doubted leader can now change the message. Check in with employees that they have received the changed message and they sense that it is unambiguous and consistent. Take on-board their feedback and act on it. Regularly check in and ask if messages are clear and consistent. Create an environment of openness in which employese feel they can call it out when mixed messages are received. Not only will the doubted leader find out a tremendous amount about their communication style, they will also increase the level of trust between themselves and their employees. When the doubted leader removes the frustration, confusion and doubt, they should share this with their colleagues who may also be sending mixed messages to their teams. Spread the word about your behaviour modification and help change that of the organisation. But what if you are a member of a team being led by a leader that is doubted due to their mixed messages? You are feeling the frustration, anger and doubt. What can you do? You need to acknowledge the situation. Earlier I mentioned ‘psychological freedom’. The problem isn’t so much with the mixed message, but it is that you cannot confront it. So acknowledge the craziness of the situation. Share it and joke about it with affable colleagues. Free yourself from the psychological affects and don’t let the mixed message mess with your head. The mixed message, of course, will impact your behaviour. Len Schlesinger and Charlie Kiefer, in HBR, give this advice. “Since undiscussability is often one of the unwritten rules of the game, proceed with caution. Remember that the ultimate remedy is to make the organizational habit of undiscussability a topic of investigation and overt discussion on the part of everyone in the system. It takes subtlety and time, and going at it very directly early on can get you in deep trouble. So, it’s best to start with a specific dilemma — the one that you immediately face. Talk to your manager about the bind you feel you are in, and have him help you navigate that specific instance. Bring it up in a light-hearted way, for example: “OK, so I need to do something and not do it at the same time. Can you give me any insight or advice on how to pull that off? Or how to balance the two? Or trade them off? How have you navigated this kind of situation successfully in the past?” Helping you is your boss’s job, and hopefully he will be a good coach. You may not get the response you sought, but you will have raised awareness of the situation and your reality. 1. What can you do when you receive mixed messages asking you to do opposing tasks? 2. Can you think of an approach that will get your leader to help you? To address the first challenge, be creative and just do what you can. Try and manage through the situation with a positive attitude and that is widely observed. Hopefully this will provide an opportunity to continue the discussion with the leader who may be prepared to listen. The second challenge is to get your leader invest in you. Demonstrate that you are actively trying to achieve the outcomes that your leader desires. Discuss both the positives as well as the negatives. Offer help. Hopefully, your leader becomes more open to working with you to eradicate the mixed message and changing his or her behaviour. If this doesn’t work, the severity of the situation may mean that you have to protect your sanity and vote with your feet! But only after trying the best you can to manage the situation. This will only happen when employees have autonomy, can self-manage and are encouraged to make-decisions, innovate and experiment. 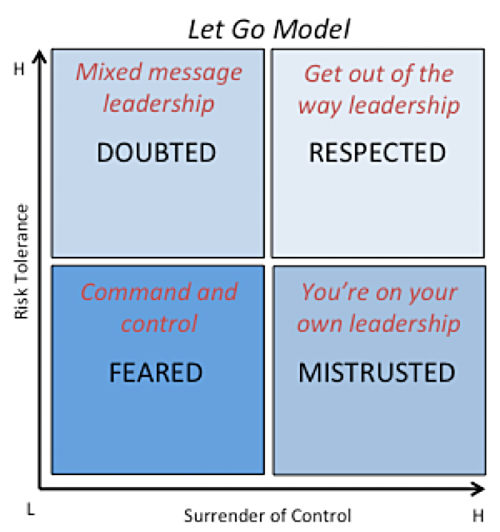 Leaders that send mixed messages and on one-hand encourage risk taking and on the other maintain a high level of control cause frustration, anger and confusion. Employee engagement will be damaged and the organisation will not innovate. It will become dormant and die. Doubted leaders have no place in the workforce today.